Changing culture and measuring behaviour change around safety can be difficult in any industry, but fleet drivers in particular can become desensitized to traditional educational shock tactics which switch the brain off. It has been shown that more severe accidents are a result of people switching their brains off. However, by switching them on, there are less accidents, damage and lost working time. Tranzaura ltd understand this issue and through the use of innovative technologies, approach driver safety differently. Their technology solution, Driver Connect engages the drivers brain, turns it on and ups their awareness before they start their working day. Through use of this technology, Transport Managers can facilitate driver training needs without having to get them in to one room, which can be a logistical nightmare. Micro-learning video content around different safety messages can be sent at a click of a button and make them better drivers. Audio, visual or textual information can be sent out directly to individual drivers, depots or company-wide for micro-learning or tactical content. Tranzaura has already taken the transport industry by storm with their suite of Transport Safety Solutions but in particular Driver Connect, as it is extremely unique in the market. 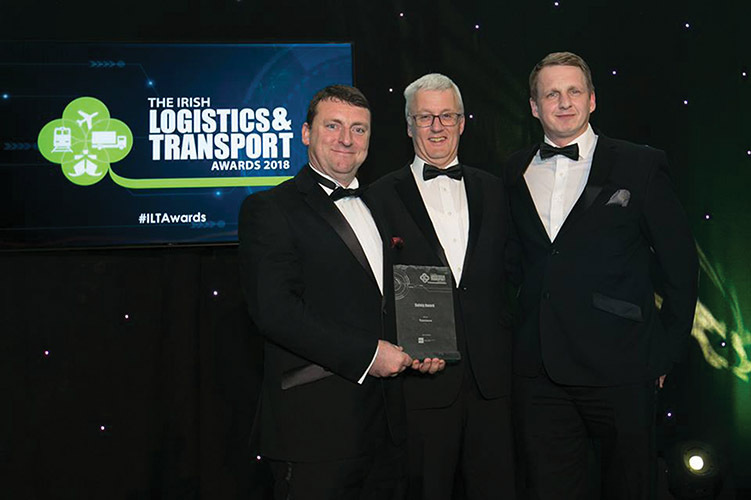 They were also the recipient of the ‘Safety Award’ sponsored by the RSA at the Irish Logistic Transport Awards on the 12th of April 2018 in recognition for the Driver Connect solution. Winning the safety award is testimony to the hard work and dedication shown by all of our staff.”, says Shane (COO). “Safety is a core component in all of our Transport Solutions, but in particular ‘Driver Connect’. We have high hopes for this solution and believe it is a unique and innovative in terms of improving safety awareness and behaviour amongst at work drivers. Not only does Driver Connect promote dynamic learning to improve driver behaviour, but it also provides a virtual communications bridge between remote drivers and the office to support retention strategies. Communications is another issue for the Transport industry that Tranzaura are looking to address through technology. By keeping drivers connected to the office whilst remote, Tranzaura believe that you can still build close relationships and ensure that you have happy drivers who feel needed and wanted. Naturally happy drivers mean, increased staff retention and knowledge as well as cost savings through avoiding re-hiring and recruitment of new drivers. The scope for this technology is pretty endless. Whether you want to enable collaborative sharing of ideas, break any language barriers or send a simple birthday message to drivers, this App can pretty much facilitate anything you need it to. Tranzaura believe in collaborating and communicating with their clients to enable them to interpret issues and customise technology solutions to address these, so current solutions can also be tailored for client needs. Over the last 7 years, Tranzaura have developed an enviable reputation for developing pioneering technology solutions that make safety, awareness and efficient work practices, the centre of everyday life, for people in transport across all industries. Shane said, ‘We set out as a compliance company but have diversified from what we set out to do in the beginning. We firmly believe that if safety is the cornerstone of an operations’ activities, efficiency and business excellence will follow’ but never forgetting to ensure compliance. Between Ireland and the U.K, Tranzaura have over 300 clients and around 20,000+ drivers using their Transport Solutions daily. Users are experiencing a significant improvement in safety levels as well as reductions in transport related operational costs. There are plans to grow their customer base a lot more and this is all part of their aim to become synonymous with safety. Some well-known companies in the Transport sector are using Driver Connect and are already seeing benefits in enhancing their safety culture among fleet drivers; this includes the likes of Travis Perkins and Yorkshire Water. Tranzaura continue to be a pioneering leader in the transport technology space with their integrated transport technology solutions now available from one platform. From Vehicle Checks, Tachograph Analysis and Workshop Management to Driver Connect, Transport Managers can now pretty much manage the operations of their fleet from this one platform. Ultimately, Tranzaura want to make the lives of Transport professionals easier and pain free!